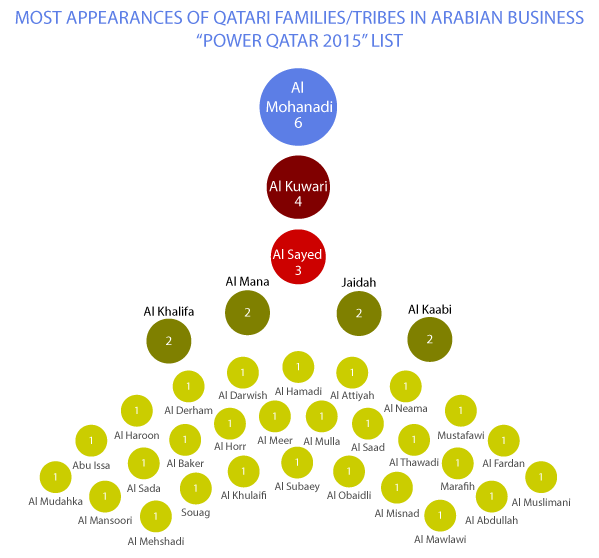 We used a myriad of different indicators to assemble this list (they appear at the end of the post) and while the fact that a family appears higher in the list might indicate it being more powerful than one that appears towards the bottom, the order of appearance should not strictly be taken as ranking (except in the case of the Al-Thani family/tribe). A separate, much shorter report in scope focuses on the individuals and highlights the incredibly close-knit nature of Qatar’s TOP businessmen. 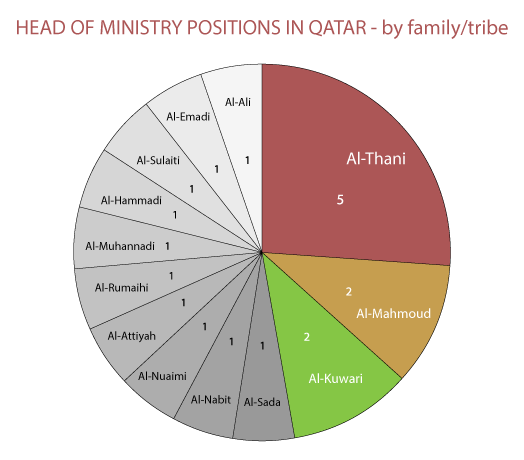 The Al-Thanis are by far the most powerful family/tribe in Qatar. There is no other that comes even close to the power they wield. This of course doesn’t come as a surprise since they have been the ruling family since the 19th century. It is widely known in academia at least, that the only contenders ruling Al-Thanis need to be wary of are members and branches of their own family/tribe. Looking at either the economic or political spheres of influence reveals that Al-Thanis are in a league of their own. As with the other Gulf countries, Qatar and the ruling Al-Thani family need to be viewed through the prism of the political theory of rentier state. In Qatar’s case that means the State receives the vast majority of its income through the sale of natural resources such as oil and gas. In turn, this income is used to ensure its legitimacy and the loyalty of both the elites within and outside of the Al-Thani family, as well as that of a large number of Qatari nationals (not all Qatari nationals are recipients of entitlements though). However in the case of Qatar, this is not as simple and goes well beyond straightforward wealth distribution, as most strongly argued by Jocelyn Sage Mitchell in her outstanding dissertation Beyond Allocation: The Politics of Legitimacy in Qatar. Besides the obvious political power of holding the posts of Emir since the 19th century, Al-Thanis have held from 18% to 63% of Ministerial positions throughout the last 45 years. At first glance you might think this means the family has been losing its power since there is an obvious downward trend. However, we need to keep in mind that all power struggles which resulted in the change of the Emir have happened in-house, be it a son overthrowing the father, a father being forced into abdication or a change between two first cousins. Practically all reported attempted coups have been led by members of the Al-Thani family itself. So, what the historical trend could potentially point to is that the need for direct allocations of power by the Emir to the rest of his tribe has been decreasing, pointing to a stronger and more consolidated role of the Emir. Looking at the business side of things, the Al-Thanis remain far above the rest. 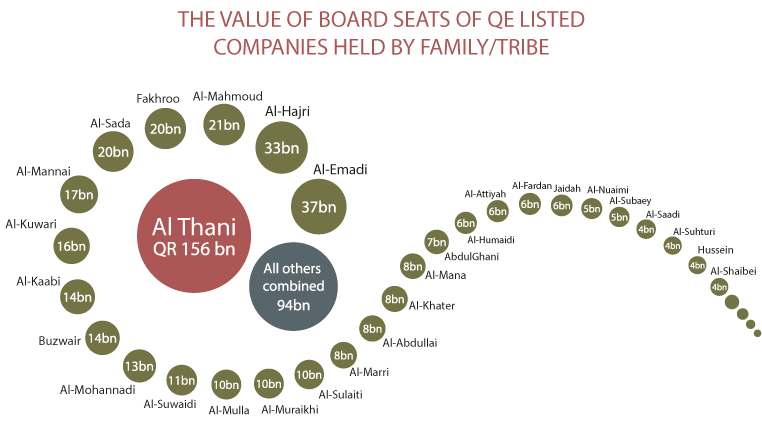 An analytical overview of Boards of Directors of the 44 Qatar Exchange listed companies reveals that 27% of all seats are in the hands of the Al-Thani family. That percentage stays the same even when the per board seat value is looked at – as in the market capitalization of a listed company divided by the number of board seats. Of the 44 listed companies, there is at least one Al-Thani member on the board of 36 of them or in other words 82% of listed companies have at least one Al-Thani member on the board. Further on, in eight listed companies the family holds over 50% of board seats. There is not a single other family that holds a majority of seats in an individual listed company. -Abdullah Bin Thani Bin Abdulla Al-Thani: QIIB, QIIC, Ezdan and Medicare. -Khalid Bin Thani Bin Abdallah Al-Thani: QIIB, Alijarah, Ezdan and Medicare. Some of these cases often allude to a branch of the Al-Thani tribe owning the majority of the company, as the members of the immediate family appear on the board. This can be seen above with the two older brothers appearing on almost the same boards. In some cases this becomes evidently clear, such as with Ezdan which was founded by Thani bin Abdullah Al-Thani, the main shareholder and most likely one of the richest men in the country. Four of his sons and two of his grandsons appear on the board of the company. A further seven individuals are Board Members of three different listed companies: Ali Bin Ghanim Bin Ali Al-Thani, Faisal Bin Thani Bin Faisal Al-Thani, Hamad Bin Faisal Bin Thani Al-Thani, Khalid Bin Khalifa Al-Thani, Mohammed bin Thani Bin Abdulla Al-Thani, Saoud bin Khalid bin Hamad Al-Thani and Turki Bin Khaled Al-Thani. A glance beyond the listed companies reveals the Al-Thani family/tribe owning many of the biggest companies in Qatar: NBK, HBK, Doha Group, 7 Brothers Group Holding, Al Jabor Group, TransInd Holding, Al Ahli Hospital, Al Faisal Holding, ARTIC, Ghanem Al-Thani Holdings, Rumailah Group and QIPCO to name just a few in a long, long list. In addition to the already mentioned positions and representations, Qatar Investment Authority, The Ministry of Economy and Trade (Ahmed bin Jassim Al Thani is also the vice chairman of Qatar Petroleum) and The Supreme Committee for Delivery and Legacy are among yet another long list of powerful institutions headed by the Al-Thani family/tribe. Truth be told the SC’s Secretary General is Hassan Al-Thawadi, however its managing director is Mohammed bin Hamad Al-Thani, the Emir’s brother. Further on Tamim himself chaired the first board meeting of 2017. Jassim bin Hamad Al Thani (Tamim’s brother) and the PM and Interior Minister Abdullah bin Nasser bin Khalifa Al Thani also sit on the board of SC. To actually go into the details of the power structures and identify the most influential branches and individuals of the Al-Thani tribe, how they connect to the Emir Tamim bin Hamad Al-Thani, which businesses they own and their roles in politics is the topic of a separate extensive report we are working on and which will in the future be available for purchase (you can get in touch with us in advance for further information). The Al-Kuwaris (also spelt Al-Kawari) – have always held positions of prominence, be they as ministers, diplomats, board members of listed companies or as directors of big Qatari organizations. In the 70s, they were especially known for supporting the idea of their daughters studying abroad, and today a lot of the Al-Kuwari women too are as actively involved as the men. Dr Hanan Mohamed Al-Kuwari is the Minister of Public Health, managing director of Hamad Medical Corporation, the main national provider of hospital care in the country and sits on the board of Sidra Hospital. Fatma Al-Kuwari was one of the first two women to be elected into Qatar’s only directly elected body, the Central Municipal Council. Other prominent Al-Kuwaris in the limelight today include Ghaith bin Mubarak Al-Kuwari, Minister of Endowments (Awqaf) and Islamic Affairs; Mohammed Jaham Al Kuwari, Qatar’s ambassador to the United States; Mohammed Al Kuwari, ambassador to Spain; Dr Hamad bin Abdulaziz Al Kawari, cultural adviser at the Emiri Diwan and Qatar’s candidate for the Director-General post at the United Nations Educational, Scientific and Cultural Organisation; Khalifa Jassim Al-Kuwari, formerly the COO of Qatar Investment Authority and its subsidiary, Qatar Holding, currently general manager of the Qatar Development Fund; Deputy Speaker of the Advisory (Shura) Council, Issa bin Rabia Al Kuwari; and Dr Ali Khalifa Al-Kuwari, democracy activist, professor and author of the notable The People Want Reform in Qatar, Too. Mohammedd Aziz S Al Saad Al-Kuwari is meanwhile the deputy chairman of Barwa. The Al-Attiyah family have been, historically speaking, the most politically powerful family besides Al-Thanis. 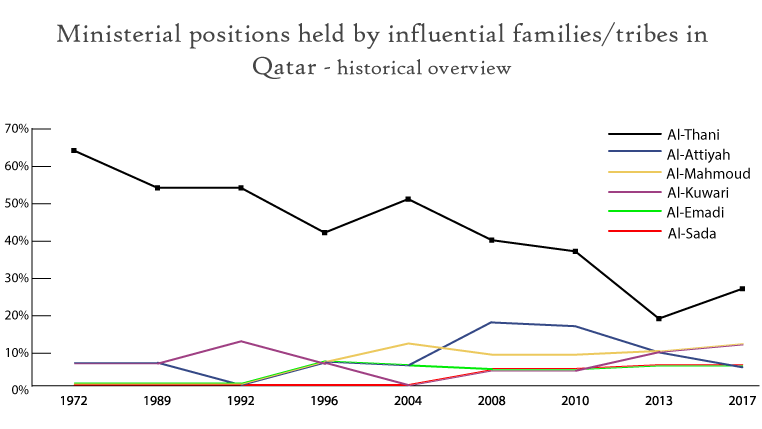 Our analysis of 134 Al-Thani marriages shows Al-Attiyahs have often married into the ruling family, which can be seen most prominently with the Father Emir’s mother being an Al-Attiyah – and they have especially held positions of power in the country’s defence and security sectors, but less so in the economic and business spheres. Prominent among the Al-Attiyahs are Khalid bin Mohammed Al-Attiyah, Minister of State for Defense Affairs and former Minister of Foreign Affairs (his father was the founder of Qatar’s Armed Forces); Major General Hamad Bin Ali Al-Attiyah, advisor to the Emir for Defense Affairs, which has the rank of Prime Minister. Through his company Al-Attiyah Group of Trading Companies, the former state minister also has partnerships (as local partner) with Western companies like G4S Qatar among others. Abdullah Bin Hamad Al-Attiyah is the chairman of Abdullah Bin Hamad Al-Attiyah International Foundation for Energy & Sustainable Development. Formerly, he was president of the Qatar Administrative Control and Transparency Authority, Minister of Energy and Industry and chairman and managing director of Qatar Petroleum, before being entrusted with the additional responsibility of Second Deputy Prime Minister in 2003. Abdullah bin Khalifa Al-Attiyah is chairman of Gulf Publishing & Printing Co, the publishers of Qatari dailies Gulf Times and Al Raya. He is also the deputy chairman of Qatar Insurance Company and Qatar Museums, and was previously the chairman of Commercial Bank of Qatar and deputy chairman of United Development Company. Mohammed Abdullah Nasser Al-Attiyah is a member of Qatar’s Advisory (Shura) Council. The Al-Mohannadis (also spelt Muhannadi), who ruled Al-Khor before Qatar’s independence, are very active today in Qatar’s business arena, occupying prominent positions both in the government and private sectors. Besides politics, they have also been involved in the oil and gas and sports sectors. Prominent among them are Minister of Justice, Dr Hassan Lahdan Saqr Al-Mohannadi; Dr Saad bin Ahmed bin Ibrahim Al Mohannadi, president of Qatar Public Works Authority (Ashghal) and former CEO of Qatar Rail; Saad Ebrahim Al Muhannadi, who has served as the president of Qatar Foundation for Education, Science and Community Development (QF) since September 2013, was appointed as a lifetime member on QF’s board of directors in 2016; Hamad Mubarak Al Muhannadi, CEO of RasGas Company Limited; and Issa bin Mohammed Al Mohannadi, chairman of Qatar Tourism Authority. Ibraheem Mohammed Al-Mesnad Al-Muhanedi is a member of Qatar’s Advisory Council. Amal Issa Al Mohannadi, a candidate in two of Qatar’s Central Municipal Council elections, was among the candidates who called for a quota for women contesting in the country’s only directly elected body. This tribe also has members who sit on boards of listed companies as well as sporting associations and federations. In the only index that is included in our report, but hasn’t been compiled by us, the Mohannadis come on top as the most represented family in Arabian Business’ Qatar Power 50 ranking. It is important to note that they have completely omitted members of the ruling family and ministers from it, making the index based more on business, economy, education and entrepreneurship. While a useful index in some aspects, Arabian Business has produced at best a mediocre product, since, when you decide to shy away from expansive research the following happens: Khalifa Saleh Al-Haroon (the founder of I Love Qatar) appears in the TOP 50 most powerful Qataris list. With all due respect to Mr. Al-Haroon, we believe he would agree that somebody like Saad Muhammad Saad Al Jubara Al-Rumaihi, who sits on the boards of three Qatar Exchange listed companies and doesn’t appear in the Power 50 ranking, is a tad more powerful. The Al Sada (also spelt Saada) family is a fairly new entrant on both Qatar’s business as well as heavy weight political scene, rising to prominence especially after one of their own became the minister of energy and industry in 2007. Dr Mohammed Saleh Abdulla Al Sada is the minister of energy and industry of Qatar as well as managing director and chairman of the board at Qatar Petroleum. He is also chairman of the board of directors at Nakilat, Qatar Electricity and Water Company and Qatar Metals Coating Company besides being vice chairman of the board of Qatar Chemical Company and Qatar Steel Company. In addition to that he appears on the Board of Directors of Qatar Foundation. Ali Hussein Ali Al Sada is a member of the board of several listed companies in Qatar including QNB, Dlala Brokerage and Qatar Navigation (Milaha) as well as his own Ali Bin Hussein Al Sada Investment Group. His son Badr Ali Hussein Al Sada is vice chairman and managing director of the latter and is also a board member of Salam International besides being chairman of Anzo Contracting Company. Abdulla Mohamed Shamsan Al-Saada is a member of Qatar Industrial Manufacturing Company’s board of directors and also a member of Qatar’s Advisory Council. The Al-Emadis are one of the most influential families in Qatar, economically speaking, which becomes quite evident by analyzing the make up of the Board of Directors of Qatar Exchange listed companies. The family is second (albeit a very distant) only to Al-Thanis both in terms of total seats held as well as the per seat value. In addition to the vast presence on the boards of listed companies, the tribe owns Al-Emadi Enterprises, one of the biggest residential and commercial real estate players in the country, as well as an array of other ventures. Further on, the family has always held a ministerial position since 1996, currently by Ali Sherif Al-Emadi leading the Ministry of Finance, in addition to being the chairman of QNB, Qatari Diar and appearing on the boards of QIA, Ooredoo, Qatar Petroleum, Qatar Foundation and Sidra Hospital among others. Other prominent members include Abdullah Mohammed Al-Emadi, who is on the board of directors at Islamic Holding Group, Qatar International Islamic Bank and Qatar Islamic Insurance Co. Originally hailing from the Al-Salata neighborhood of Doha, the Al-Sulaiti family has a strong presence in Qatar’s business world, appearing on the boards of companies like Mesaieed Petrochemicals, Barwa, Woqod and Nakilat to name a few. Ahmad Saif Al-Sulaiti is the chairman of Mesaieed Petrochemicals, the vice vhairman of Nakilat and Woqod; Moza Mohamed Al-Sulaiti is one of the handful of women that appear on the boards of QE listed companies and sits on the board of Dlala Holding; Mubarak Bin Abdulla Al Sulaiti is the chairman of Sulaiti Law Firm. Further on Jassim Seif Ahmed Al Sulaiti is the vice chairman of Qatar Rail and the current Minister of Transport and Communications, marking the family’s fairly recent entrance into the world of top level politics. The Al-Khater family’s ties to the Al Thani’s go way back, to the inception of modern Qatar, and continue to be consolidated through marriages. Wakrah is where they set up their city and it continues to be the tribe’s stronghold. They used to occupy more ministerial positions in the past than they do currently, and have consistently been present on Qatar’s diplomatic scene as well as Advisory Council. The most publicly visible member of the tribe has to be Turki Mohammed Khaled Al-Khater, who seats on the board of three QE listed companies: UDC as chairman, Masraf Al Rayan as vice chairman, and Ooredoo as a board member. He is also the president of the General Retirement and Social Insurance Authority​. A further important figure is Sultan Rashid Al-Khater who seats on the board of Qatar Central Bank. According to a 1890 British report, the Al-Nuaimis were one of the most powerful tribes in Qatar at the time and are today the ruling family of Ajman in the UAE. The family found itself for the first time in the world of high politics with Issa Saad Al-Jafali Al-Nuaimi being appointed as the Minister of Administrative Development, Labor and Social Affairs when Tamim bin Hamad Al-Thani first reshuffled the cabinet in 2013. Some of the family’s many influential members are Rashid bin Fahad Al-Naimi who holds multiple top level positions from the CEO of Qatar Foundation Investments to being the chairman of Mazaya Qatar, MEEZA and Gulf Bridge International (GBI) and a board member of Vodafone Qatar. Aisha Fahad S Al-Nuaimi is one of the most prominent businesswomen in Qatar, seating on the board of directors at Nakilat, Barwa Bank and Qatar Finance House and possibly elsewhere as well. Salem Bin Butti Al-Naimi is the chairman and MD of Qatar National Cement Company and Qatar Shipping Company and deputy chairman of Alijarah. Al-Suwaidis have historically been marrying into the Al-Thani tribe and although the data available to work on is relatively small (134 marriages were analyzed) they stand out as the most preferred non Al-Thani spouses the Al-Thani family marries. One of the most notable individuals is Abdulrahman Mohamed Al-Suwaidi, who seats on the board of Industries Qatar, is the chairman of Qatar Chemical Group Companies Ltd, chairman of ORYX GTL and member of the board of directors at Muntajat. Further on Mr. Al-Suwaidi is the MD/CEO of Qatar Fertiliser Company (QAFCO) and a member of National Human Rights Committee (NHRC). Another very influential member of the Suwaidi family is Faisal M. Alsuwaidi, the president of R&D at Qatar Foundation. The role includes leadership of all scientific research and development at QF, such as projects under Qatar National Research Fund and Qatar Science & Technology Park, as well as overseeing the Qatar National Research Strategy. Previously he was the vice chairman and CEO of Qatargas. The Fakhroo family (Banu Tamim) are among the oldest business families in Qatar. They used to hold a lot of clout as advisers to the emirs of Qatar and later owned Darwish Travel Bureau, the precursor to today’s Qatar Aviation Services (Qatar National Travels, Trans Orient and Ali bin Ali came after DTB). Al-Darwish, Al-Othman, Al-Obaidans and Al-Hassan are all part of the Fakhroo family. The Darwish Group of companies consolidated by brothers Abdullah, Jassem (Kassem) and Abdul Rahman in the 20s and 30s are run by their heirs (after having been divided amongst them) today and famously known as Darwish Holding and Darwish Trading Company. Some of the most prominent members of the family include Bader Abdullah Darwish Fakhroo who seats on the board of directors at QNB, while also being the chairman and MD of Darwish Holding. Aziz Aluthman Fakhroo is the director of the State Budget at the Ministry of Finance and seats on the boards of Ooredoo and Canary Wharf among numerous others. Ahmed Abdul Rahman Yousuf Obaidan Fakhroo is the vice chairman of Doha Bank. The Al Mana family, from the Bani Tamim tribe of Saudi Arabia, are among Qatar’s oldest business families and they hold numerous board positions. The family founded some of Qatar’s biggest companies – Mohammed Abdul Latif Almana & Bros (Almana & Partners); Mohammed Hamad Al Mana; Saleh Hamad Al Mana; Almana group (Omar Hamad Al Mana) in the 50s and 60s with business interests in every major sector from automotive to FMCG and industrial. Redco Construction joined the fold later. They have also consistently held key diplomatic positions – Qatar’s first ambassador to the United States was Abdullah Saleh Al Mana. Before Hamad bin Khalifa became the Emir, the family often held ministerial positions too, however in the last 20 years, they have not held a single ministerial portfolio. Among its many prominent members, the most recognizable world over is of course Wissam Al-Mana, the executive director of Al Mana Group and husband of Janet Jackson. Other noticeable public figures include Hamad bin Mohammed bin Hamad Al-Mana, who appears on the boards of Doha Bank, Milaha and Qatar General Insurance and Reinsurance Company; Saud Omar Al-Mana – a board member of Doha Insurance and ZAD and Nawaf Ibrahim Al-Mana, board member at UDC and Widam Food. While the Al-Khulaifi family does not in particular come up very high on any of our indicators, it is nevertheless present across the political and economic sphere of the country. Mohammed Bin Mubarak Al-Khulaifi for example is the Speaker of Qatar’s Advisory (Shura) Council, a body which in accordance to the country’s constitution is supposed to be two-thirds elected and one-third appointed by the Emir. In reality the elections have been continuously postponed (most recently in 2016 by Tamim bin Hamad Al-Thani) and the Emir appoints all the members directly. The power of the Advisory Council has been often debated and to an extent dismissed, however during Hamad’s rule the body gained more influence than in Khalifa’s time. 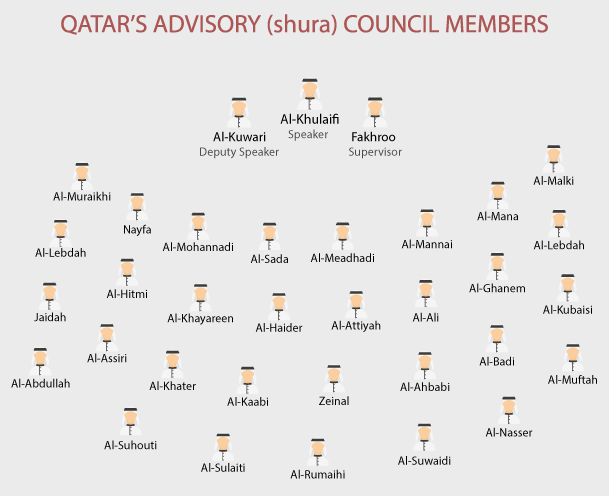 The Shura council serves as a good representation of notable families in Qatar as well as large tribes. The Emir has been known to, on occasion, accept the Advisory Council’s amendments to legislation stemming from the Council of Ministers. The Al Hajri family, from Bani Hajer, are more prominent today than they were under the previous rulers. Back then they held key positions in the police primarily, while today they play a bigger role in Qatar’s business and diplomatic landscape. The family is now also closely connected to the ruling family through the marriage of Anoud bint Mana Al Hajri to Qatar’s Emir Sheikh Tamim Bin Hamad Al Thani. Al-Hajris feature very highly when it comes to representation on the boards of directors, as well as being the second most represented tribe on the Central Municipal Council, which indicates they are a big tribe (see the Al-Marris for more details on the CMC and what that implies). One of its most prominent members is Mohammed Nasser Al-Hajiri, the vice chairman of Industries Qatar as well as a board member of Woqod and QFB. Meanwhile Rashid Misfer Al-Hajri seats on the board of QNB. The Al-Mahmouds are one of the most constant forces in modern Qatar’s politics, having led ministries ever since Hamad bin Khalifa Al-Thani became the Emir in 1995. Ahmed bin Abdullah bin Zaid Al-Mahmoud is currently the Deputy Prime Minister and Minister of State for Cabinet Affairs, while his daughter Shaikha bint Ahmed al Mahmoud was the first ever woman to be appointed a minister in any Gulf State. This happened in 2003, when she became the Minister of Education, a post she held until 2009 when Saad bin Ibrahim al-Mahmoud took over the ministry, of which he was in charge until 2013. In terms of business the family might not appear on the boards as much as some others, however where it does appear is in some of the biggest companies in Qatar. Mansoor Ebrahim Al-Mahmoud is the CEO of Qatar Museums and seats on the board of directors of QNB, Qatari Diar and Hassad Food Company. Others include Ibrahim Abdulla Al-Mahmoud, board member of Ooredoo and Abdullatif Bin Abdulla Al-Mahmoud, vice chairman at Qatar Islamic Bank. The Al-Kaabi tribe is a powerful presence in Qatar’s business world, especially with Saad Sherida Al-Kaabi serving as the President & CEO of Qatar Petroleum. He is also the chairman and managing director of Industries Qatar and chairman of Qatargas. His father Sherida Saad Al-Kaabi is the founder of Al-Balagh Trading and used to be Qatar’s Ambassador to Egypt and India in the 70s and later to UK in the 80s. He is currently also on the Board of the prestigious Qatar Businessmen Association. Sherida was at one point one of the most (critically) outspoken businessmen in the Qatar Chamber and was constantly featured in the Arabic media. Further noticeable members include Nasser bin Rashid bin Sraiya Al-Kaabi, who seats on the boards of QIB and QIMC in addition to owning the Al-Sraiya Group and Al-Kaabi Contracting and Trading. His son Rashid bin Nasser Al-Kaabi meanwhile acts as the vice-chairman of Al-Sraiya Group as well as appearing on the boards of QIIC and Qatar Islamic Holding. 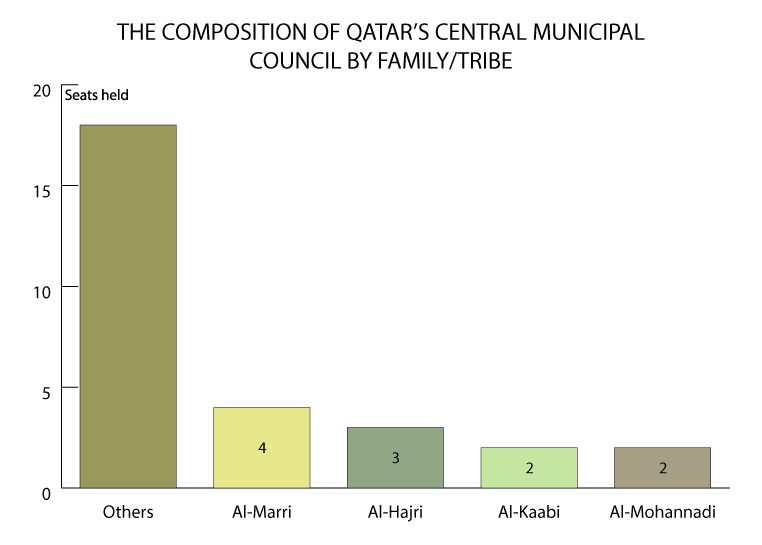 The Al-Marri tribe (also spelled Al-Murrah) is one of the biggest in Qatar, which becomes most apparent in the number of Central Municipal Council seats they won at the last elections in 2015. According to surveys that have been done on the voting patterns practically all votes are cast based on family and tribe alliances. The CMC elections are perhaps the only insight into popular powers at play in Qatar. An analysis of the candidates for the elections reveals that tribes like the Al-Thani did not participate at all. The Al-Marri tribe has found itself in the international spotlight after Qatar revoked citizenship of about 5,000 to 6,000 members of the Al Ghafran clan of the Al Murrah tribe and exiled them to Saudi Arabia in 2005, allegedly for playing a major role in the failed counter-coup of 1996. Various reports linked the loss of citizenship to other factors such as the dismissal of the former Minister of Interior, Hamad Bin Nasser Al Thani, who is said to have “facilitated” citizenship and special passports for a large number of Al Murrah tribesmen, causing concern in Qatar and abroad. The tribe used to hold ministerial positions between 1996 and 2013 when Ahmed bin Abdullah Al-Marri headed the Ministry of Endowments and Islamic Affairs, until Tamim bin Hamad Al-Thani became the Emir. On the business side of things, one of its most prominent members is Nasser Jaralla S. Jaralla Al-Marri, who is a board member of Masraf Al Rayan, UDC and Vodafone. Mohamed Salem Alyan Al-Marri is meanwhile the vice chairman of Mesaieed Petrochemicals. The Jaidah family’s presence in Qatar dates back to the 1880s with Ibrahim Yousef Jaidah a merchant who founded Jaidah Group. His descendants expanded the business over the years and today it also includes The Gritti Palace in Venice in its portfolio. Some of the prominent members of the family include Jassim Mohammed Jaidah who is the chairman of Jaidah Group and board member of Qatar Insurance Company; renowned architect Ibrahim Mohammed Jaidah, also a board member of Qatar First Bank; Mazen Jassim Jaidah who is on the board of Qatar Foundation and Milaha; and Nasser Khalil Jaidah, board member of Qatar Petroleum and Qatar Electricity & Water Company and formerly CEO of Qatar Petroleum International (now integrated into QP). The Al-Rumaihi family/tribe found its place in the highest levels of politics with the recent appointment of Muhammad bin Abdullah al-Rumaihi as the Minister of Municipality and Environment, upon previously having served as the Assistant Foreign Minister, as well as being the Ambassador to USA, France, Belgium and Switzerland among other posts. Another prominent member is Saad Muhammad Saad Al Jubara Al-Rumaihi, who seats on as many as three different boards of QE listed companies: Milaha, Qatar National Cement Company and QIMC. The Al-Fardan family has dominated Qatar’s luxury sector for decades. Patriarch Hussain Ibrahim Alfardan is the driving force behind one of the most successful and powerful family-owned conglomerates in region. Hussein is chairman of Alfardan Group Holding Co., managing director of The Commercial Bank and vice chairman since March 2014 (he co-founded the bank in the 70s), and board member of Qatar Insurance Company. The Alfardan family are now connected to the ruling family, albeit distantly, through the marriage of Hussain’s grand daughter to Sultan Al Thani. The Al-Subaey family used to exert a lot of political influence in the past when they consistently held positions of power by leading the Ministries of Education and Youth Welfare, Public Works and Industry, Electricity and Water and Justice. Today its family members seat on many boards with Khalifa Abdulla Turki Al-Subaey serving as the CEO and MD of InterTec Group, of Q-Re, Qatar Insurance Company, Damaan Islamic Insurance Company and seats on the board of Qatar Finance and Business Academy among others. Abdulla Abdulaziz T. Al Subaie is the managing director of Qatar Rail, while Khalid Mohamed Al-Subaey seats on the board of MPHC and is also its managing director. The Al-Mannai are another prominent old business family in Qatar, which was historicaly based in the village of Abu Dhalouf. They founded and established the famous Mannai Corporation, which they sold to QIPCO later on. Today they own the Teyseer Group, the chairman of which is Abdul Rahman Essa Al Mannai. Abdulaziz Mohammed Al-Mannai is meanwhile on the board of Industries Qatar and Mesaieed Petrochemicals. Other members of the tribe can be found on boards of Qatar Insurance and Gulf International. This report is part of Priya DSouza Consultancy’s business intelligence offer. For more information on the Al-Thani and similar reports, see the Consultancy page or email us at contact@priyadsouza.com. 8.) Number of appearances per family on Arabian Business’ Power Qatar 50 list.